Usually I don’t care much about eQSL.cc. Occasionally I upload my logs there, too, for all those who like these “cards”. While doing it I fly over the inbox and mark the “cards” received for archiving. 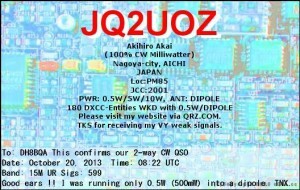 This time one comment line entry caught my eye, you can see it on the QSL pictured at the right: JQ2UOZ confirmed our QSO on 15 m CW during last year’s WAG contest when he was using just 500 mW and a dipole! That’s not too bad! I am sure the 6 ele OWA yagi on our side as well as the superb condx we had helped quite a bit to make that contact possible, too. 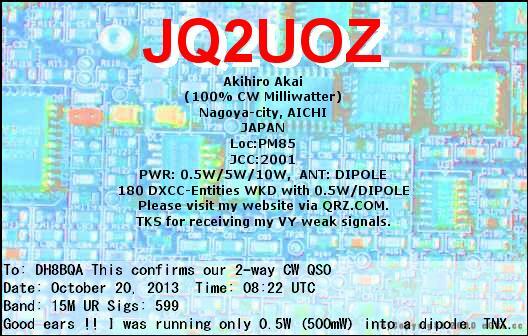 😉 Aki-san has now worked over 180 DXCC countries on 500 mW – that’s quite an achievement! More details are on his qrz.com website. He’s got a nice blog, too. Back when I was a QRP only guy myself (yes, I had such a phase when money was too tight, hi) I sometimes put my FT-817’s power down from 5 watts to 500 mW, too, just to see if a QSO would work. My personal best was from Germany down to ZS, South Africa, on 10 m CW in the middle of the last sunspot minimum. Sure the old 3 ele Yagi we had up on the tower back then helped with that contact, too. Although to work ZS is certainly nothing special it is the circumstances that make these contacts memorable. This entry was posted in QRP, QSLs. Bookmark the permalink.